Less than 20% of infrared energy heats the air, while over 80% directly translates into body heat. So you can spend longer in a MetaChamber than a conventional sauna, time spent with greater efficiency. 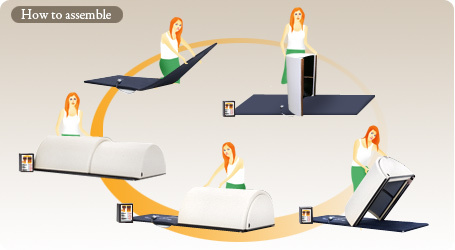 The Meta Chamber System sets the highest standards for a 1-person sauna, with even-heating Nano-Carbon technology over 5 panels in both domes, and 2 in the MetaPad. Solid, luxury construction, reliability, comfort and elegant design, plus an unbeatable warranty. The same solid construction, luxurious finish, sturdy wooden control box. Floor-to-floor Nano-Carbon heating elements over the inside of the dome. Powerful warming technology, includes Comfort Foot Heater too! The same sturdy and powerful control box to customize your sauna experience. All accessories and convenience of design, the same! But not the much higher price of a system like the Sunlight Solo, at nearly $3000! Aesthetically pleasing. Wooden control box has a classic look of elegance. The cream leather like exterior gives a pleasant feeling of comfort and value. Easy to store. The lower dome slides under the upper dome to reduce in size by one half. The accessories can be placed inside the dome and the entire unit can be placed in the corner of the room. Use it as a table base or throw it in the closet! The timer tells you when your session is up, and can be set up to 60 min. Temperature can be controlled separately for the upper and lower domes. Each dome can be set from low to high with 9 intervals for the perfect heat setting. The Meta Chamber's super Far Infrared emitting heat panels cover the entire interior surface of the dome. - To incorporate Nano-Carbon Far Infrared heat panels throughout the interior of the dome! - To provide Far Infrared emissivity at 95% from 4-20 microns! - To offer flexible timer control from 5 minutes to 12 hours! - To emit Far Infrared from its entire surface area! - To use comfortable and sanitary, breathable and waterproof material! - To be designed for the discerning customer of the future! Dimensions 175 cm x 71cm x 46 cm / 70 " x 28.5" x 18.5"